It’s funny how certain recipes get really popular in the food blogging world. I saw these Ham and Cheddar Pretzel Bites on Pink Parsley a couple months ago and thought they looked fun. Then I noticed the original recipe was from Gourmet – even better! I thought these would be a kid and adult friendly snack at my niece’s second birthday party a couple weeks ago. Since seeing the recipe on Josie’s blog, they’ve been popping up everywhere. So for my food blogger readers – I apologize if you’ve seen this one several times already. I am sorry that I’ve been so slack with the blog this week. I’ve had a lot going on and no time to sit down at night to update. We have friends coming to stay with us tonight so I’ve been a busy bee trying to get our tiny apartment presentable and ready for guests. Also, we’ve been dealing with house hunting drama. Thought we finally found something we were excited about making an offer on this week but it didn’t work out. I am seriously sick of looking at houses! It’s been a long process. It’s been a pretty lackluster week on the fitness front too. More rest days than I’ve had in a long time – which maybe isn’t a bad thing considering the injury and general soreness I’ve had the last several weeks. I taught BodyPump Monday, hot vinyasa yoga Tuesday, rest day Wednesday and taught BodyPump last night. Today is looking like a rest day too. I set my alarm to go to yoga this morning but we didn’t make it to bed until midnight last night (so late for us) so I was not ready to get up at 5:45 a.m. Hoping to get some good yoga classes in this weekend and test my leg out with an easy run. 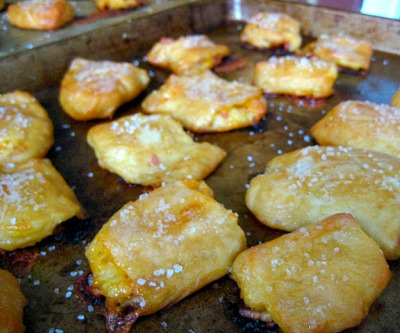 These Ham and Cheddar Pretzel Bites were a good snack for the birthday party but not something I think I will make again. This was my first time making soft pretzels and I enjoyed the process of making them. It was fun and different. But in the end I didn’t think these were worth all of the work. There just wasn’t enough ham and cheddar flavor to them and I think the dough itself could have used a little salt. I even added more ham and cheddar than the original recipe called for. Also, I will say that they were much better warm out of the oven than served room temperature. I’m really surprised that I didn’t love these because they did receive great reviews from the other bloggers who made them? Promise more updates over the weekend and next week! I’ve got some good stuff planned! Stir together yeast, 1 teaspoon brown sugar and warm water in a large bowl. Let stand until foamy, 5 to 8 minutes (if mixture doesn’t foam, start over with new yeast). In a separate bowl, stir remaining 2 tablespoons brown sugar into warm milk until dissolved. I used my Kitchen Aid stand mixer for the following steps but you can definitely just follow these directions: add 2 1/2 cups flour and the milk mixture to yeast mixture and stir with a wooden spoon or rubber spatula until a soft dough forms. Add up to 1/2 cup additional flour, a little at a time, if necessary (which it probably will be – this is an extremely sticky dough). Turn out dough onto a floured surface and gently knead with floured hands a few times to form a smooth ball. Transfer to a clean bowl. Cover with plastic wrap and let rise in a draft-free place at warm room (ideally around 80 degrees) until doubled and bubbles appear on surface, about 2 hours. 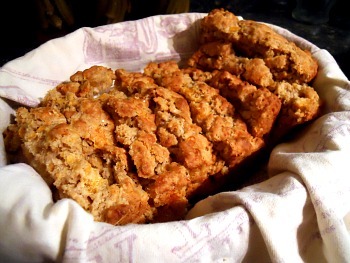 Tip – I like to let my bread rise in the oven. I turn it on for a minute or two then switch it off and place the bread in there to rise. Turn out dough onto a floured surface and cut into four equal pieces. Working with floured hands, gently roll and stretch one piece of dough to form a 12-inch-long rope. Flatten dough and arrange so a long side is nearest you. Roll out to a roughly 12- by 4-inch rectangle with a lightly floured rolling pin. Gently press one fourth of ham and cheese into lower third of rectangle, leaving a 1/2-inch border along bottom edge. Stretch bottom edge of dough up over filling and press tightly to seal, then roll up as tightly as possible to form a rope. Cut rope into 12 pieces and transfer to prepared baking sheet. Make three more ropes using the same method. Let rest at room temperature, uncovered, 30 minutes (dough will rise slightly). Preheat oven to 400 degrees with rack in upper and lower thirds. Line two baking sheets with parchment paper. Bring 6 cups of water to a boil in a large saucepan. Reduce heat to a simmer and stir in baking soda. Cook pretzel bites in batches in gently simmering water, turning once, until slightly puffed, about 20 seconds total. Transfer with a slotted spoon to baking sheets. 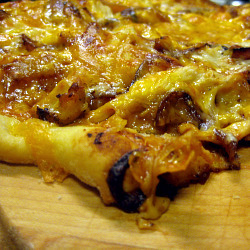 Bake until puffed and golden-brown, about 15 minutes. 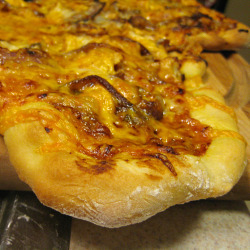 Don’t be alarmed if cheese oozes out a bit. When you remove pretzels from oven, brush with butter and sprinkle with salt. 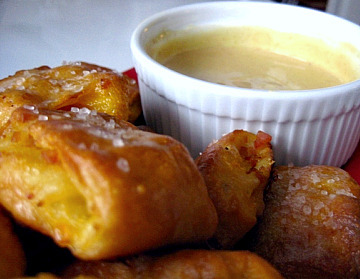 Serve warm or at room temperature with a honey mustard dipping sauce, if desired. (See original Jalepeno Honey Mustard in original recipe or see my favorite honey mustard here). 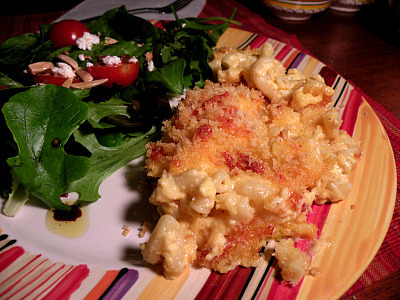 Macaroni and cheese is one of my favorite comfort food dinners. I just serve it with a green salad and call it a meal. (Who needs meat anyway when you can just eat more mac and cheese!?) The method in this recipe is pretty basic for mac and cheese: make a roux, stir in milk, cream and cheese, mix in macaroni, sprinkle on topping and bake. 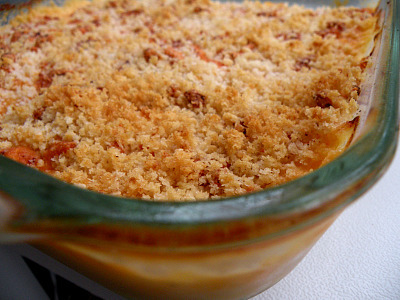 The results are a creamy, cheesy mac and cheese with a crunchy topping – heaven! I’m already planning the next time that I’ll make this…and that will be this weekend. My sister-in-law just brought home a new baby and I know they will love this mac and cheese. This recipe makes a full 11 x 17 pan so it’s perfect for leftovers or entertaining. 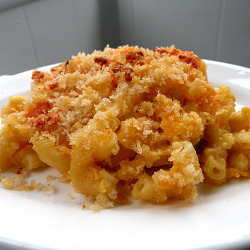 Please try this and let me know how it compares to other mac and cheese recipes! This has definitely been one of the highlight recipes of 68 Days of Gourmet so far and I know I’ll be making this for years to come. Preheat oven to 400 degrees. Grease a 3-4 quart baking dish or 13 x 9 pan with butter or cooking spray. Mix together panko, butter and cheese in a medium bowl. Set aside. Melt butter in a heavy pot over low heat. Whisk in flour and red pepper flakes and cook, whisking constantly, for about 3 minutes to make a roux. Whisk in milk in a slow steady stream. Increase heat and bring to a boil, whisking constantly. Simmer for another 3 minutes, stirring frequently until mixture is thickened a bit. Stir in cream, cheese, mustard, salt and pepper until cheese is melted. Remove from heat and set aside. Cook macaroni according to package directions, making sure to add plenty of the salt to the cooking water. (At least 1 tablespoon for every 4 quarts.) Undercook macaroni about 3-4 minutes so that it still has quite a bite to it. This ensures the pasta won’t get mushy when cooking. Reserve 1 cup pasta water and then drain noodles. Stir together macaroni, reserved cooking water and sauce in a large bowl or in your sauce pot if it’s big enough. Transfer to prepared baking dish, mixture will be loose. Sprinkle topping evenly over mixture and bake for about 25-35 minutes. Top should be golden and bubbling. This was another one of the easy weeknight dishes that Gourmet Editor-in-Chief Ruth Reichl mentioned on NPRs Fresh Air (explanation in the Spiced Chicken post). I’ve always wanted to try to make Spaghetti Carbonara because I thought it sounded like something Brandon would love. Bacon, eggs and cheese in pasta – seriously? It’s a strange combination but the final result is pure simplicity and deliciousness. How’s that for a description? The method for putting this together is a little different. You whisk together the eggs and cheese and stir it into the cooked pasta. It creates a creamy mixture without actually using cream. You toss everything together with the cooked meat and onions. This pasta is not fussy and you probably have the ingredients on hand in your pantry. It’s perfect for a comforting weeknight meal. The recipe makes a ton so it’s great for leftovers or to feed a family. Saute bacon or pancetta in a large heavy skillet over medium heat. Stir until fat begins to render, about 1 to 2 minutes. Add onion and cook for another 8 minutes, until it becomes transparent. Add the garlic and continue sauteing for another 2 minutes. Add wine, increase heat to medium high and boil until reduced by half, 1 to 2 minutes. Follow directions on package for cooking spaghetti. Make sure to cook in salted water. While pasta is cooking, whisk together eggs, cheese, pepper and salt in a small bowl. Drain spaghetti in a colander and add to onion mixture. Toss with tongs over moderate heat until onion mixture is incorporated. Remove from heat and add egg mixture, tossing to combine. Serve immediately. * NOTE: The eggs in this recipe might not be fully cooked. This may be a concern if you are pregnant or if salmonella is a problem in your area. These Incredulada Enchiladas have gained quite a fan base. Once you scroll down and read the ingredients to the recipe I guarantee you’ll think, “Are you kidding me?” They are a splurge but always a crowd pleaser. My mother in law introduced us to Incredulada Enchiladas and they are well, incredible. 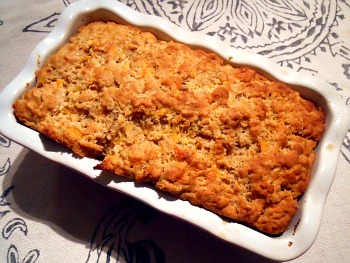 I’ve shared the recipe with friends, served them at parties, taken them to expecting mothers and they’re always a hit. What’s not to love about the creamy chicken filling topped with cream and cheese? Garnish with sour cream and salsa and you’re in for a treat! Preheat oven to 350 degrees. Prepare a 9 x 13 glass baking dish with cooking spray. Heat olive oil in a large skillet and sautee onions until they begin to soften and become translucent. Add garlic, chilies and peppers and cook for another 2-3 minutes. Remove from heat and stir in cream cheese and chicken. Season with salt and pepper. Spoon mixture into tortillas, roll and place seam side down in baking dish. Pour cream over enchiladas and cover with cheese. Bake for about 30 minutes, or until cream thickens and cheese is bubbly.